One is a former member of Take That who now has a successful solo career, the other is one of Russia's richest men and shareholder of Arsenal football club. 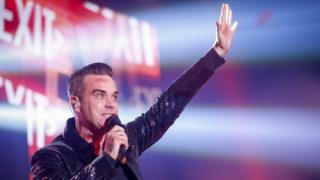 Together, Robbie Williams and Alisher Usmanov are putting on a concert for the people of Uzbekistan. According to Uzbek English-language news publication The Tashkent Times, the Let Me Entertain You singer is performing this evening at the Palace of International Forums in the country's capital Tashkent. Uzbek-born oligarch Usmanov, who is a 29 per cent shareholder in Arsenal, is the man bringing Williams to the country. But tickets for the concert are not cheap, ranging from 1.5 million to 1.8 million soms (£110-£170, $185-$222), which is more than the average Uzbek monthly salary. Reaction to the concert has been mixed, with some asking why, when many Uzbeks are struggling with the cost of living, a concert is being staged featuring an artist relatively unknown in the country. "This will be the tycoon's New Year gift to the people of Uzbekistan," said Podrobno.uz, a privately-owned Uzbek news website. However, in a seperate report, the website also highlighted items which Uzbeks could purchase instead of a concert ticket, such as: "377 kg of potatoes, 1,360 flat breads, 38 kg of meat, 314 kg of flour." On Facebook, news of the concert attracted hundreds of comments. One Facebook user posted: "What kind of gift is this? Gifts are free of charge and from the bottom of the heart, and not for business, money or respect." Others were excited by the news: "It is time to open and explore the music culture of the west, in particular British pop music," posted another Facebook user. "Williams is quite a decent performer who has a big repertoire of songs, motivating and encouraging people." Another commented on Usmanov's 'gift' to the Uzbek people: "He would have been better off if he had helped children with cancer; that would have been a gift!" In an apparent reference to energy and food shortages in the country's regions, another Facebook comment read: "He could have provided regions with potatoes, gas and electricity." Many Uzbeks believe Uzbekistan's economy has suffered under the isolationist policies of its late leader Islam Karimov. The country has been left with an unfavourable business climate and lack of industrial development, remaining reliant on exports of natural resources. The new president Shavkat Mirziyoyev has been trying to open up the country for foreign investors, and Usmanov is one of them. But the reforms have only started and the economy is now undergoing a transition period, which means many people are feeling the pinch. Its not the first time Uzbekistan has hosted global artists. Andrea Bocelli, Julio Iglesias, and Anna Netrebko are among the world-renowned singers who have performed in Tashkent over the last few years. Sting has also performed in the country, although amid some controversy. In 2010 the British singer was criticised in media reports, including The Guardian, which claimed he accepted more than £1m to perform for Gulnara Karimova, the daughter of Islam Karimov, Uzbekistan's late leader. Karimov died in September 2016 and was the country's first president. His rule saw the country emerge from the collapsing Soviet Union to become an independent nation. Human rights groups say that, under Karimov, Uzbek security services carried out abuses using slave labour, torture and even boiling people alive. However, in the past year some cautious reforms have been passed under Mirziyoyev's presidency.